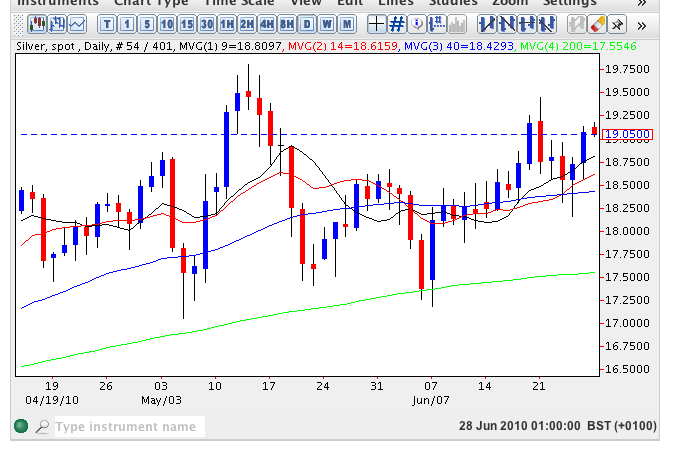 Spot silver prices followed gold higher on Friday ending the week with a wide spread up candle which closed well above all four moving averages and marginally above the psychological $19 per ounce price handle. Following Thursday’s hammer candle Friday’s positive price action was much as expected and with both the 9 and 14 day moving average now crossing above the 40 day moving average the outlook for spot silver remains bullish and the initial target for the metal remains a break and hold above $19.80 which should see a run on towards $20 per ounce and beyond in the medium term. With the outlook for gold also looking bullish, and set to break into new high ground, this should provide the necessary momentum for spot silver as a result.